While you are busy at an important work on your computer, you are absolutely reluctant to pick up the phone to read a text message that may appear, not to mention how you hate to type the reply to the message on the phone. How nice it would be if you can read the message and ignore it or reply it through your computer! This is absolutely possible with SyncMate Expert as this app allows you to read, write, delete, create, send and export text messages to other formats. SyncMate has plenty of syncing power, despite being easy to use and understand. The tool has both, free as well as paid version called Expert. While the free SyncMate will allow you to sync contacts and events between Android and Mac, Expert allows you to sync folders, photos, music and playlists and more. Expert also allows you to mount Android as a Mac disk and automatically sync all supported data in the background. 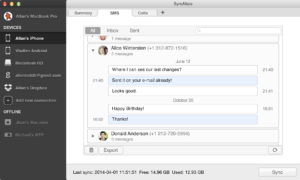 You can read text messages from your Android on your Mac screen (Inbox, Sent, Outbox, Draft) with the free SyncMate, an app to manage Android SMS on Mac. To get contact names displayed, you will have to sync contacts between Android and Mac. Plenty can be done with your texts with SyncMate Expert on your big screen using its keyboard. You can read, write, reply, delete, send, export to different formats or search through your messages. Connect your Android device to Mac. Just open your SyncMate and send the SMS! You can even send a message to multiple recipients simultaneously. 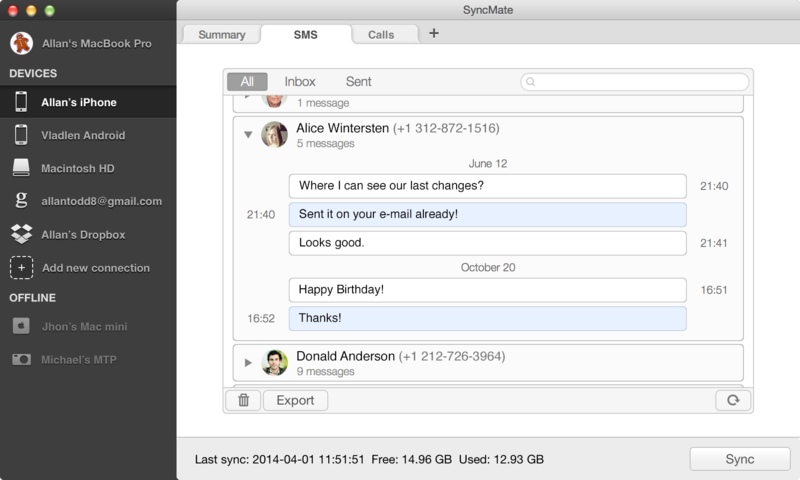 You can export SMS with SyncMate from your Android device to your Mac in formats like TXT, HTML and CSV to refer later. SyncMate is an app that syncs your Android or iOS device, online accounts and storages, other Mac computers and Windows services. It’s compatible with Android 4.x-7.x and iOS 5.x-10.x devices and needs OS X 10.8.5.